Virtual Reality Is Suddenly Cool Again With The Oculus Rift | OhGizmo! By David Ponce on 08/02/12 • Leave a comment! Those of you old enough might remember the short period in the early 90’s when everyone went crazy over virtual reality. It was the future! Only the future was very heavy, uncomfortable, had terrible lag and eventually fizzled out like so many other futuristic technologies that were supposed to “change the game.” But everything old is new again, and the Oculus Rift is a renewed attempt at bringing virtual reality back. This time around however the technology is nowhere near where it was in the 90’s; processors are faster, screens’ resolutions higher, materials cheaper and lighter. So maybe the Rift stands a chance. It’s a 220g (about 0.5lbs) visor with an immersive, stereoscopic 110 degree diagonal display. This means that you don’t actually see the screen: you’re immersed in the image. Also the sensors for head tracking are advanced enough that latency is ultra low, allowing you to move your head in all six axes and have the image follow in front of your eyes, and not slightly behind. What’s perhaps better is that this isn’t a quirky project by some dude in his basement. Palmer Luckey, the creator of the Rift, has the backing of several industry big wigs like John Carmak from IdSoftware, Gabe Newell from Valve, Cliff Blezinksi from Epic games and higher ups at Gaikai and Unity. They’ve all tried the prototype and they all got excited and will develop for it. 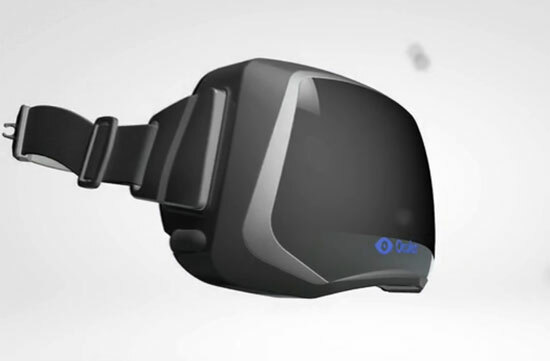 So right now you can pre-order your own Oculus Rift from Kickstarter for $300. It comes with a copy of Doom 3 BFG, the first game developed for it and should ship in December of this year. Hit the jump for links and a video.